We’ve updated our list of ten hikes around our neck of the woods that are great for enjoying springtime. Western North Carolina has elevations between 1,000 and 6,690 feet, so keep in mind that late March and early/mid-April may still be on the wintry side in the mountains at the higher elevations, while the flowers and flowering trees are blooming at middle elevations such as ours at 2,300 feet. By the end of April and first part of May, spring takes hold everywhere. Catawba Falls in Old Fort – Just 20 minutes from the Inn on Mill Creek is the Catawba Falls Trail, which leads through a lovely wooded area along the headwaters of the Catawba River, 1.5 miles to one of the prettiest waterfalls in our area. A new parking area at the trailhead was put in by the US Forest Service in 2012, and through a purchase agreement between the Foothills Land Conservancy and the Forest Service, the entire trail and Catawba Falls is now inside the protected Pisgah National Forest, to be used for the public’s enjoyment. And enjoy you will, because the cascading waterfall is over 300(!) feet and looks rather majestic, especially in the springtime after the snow melts and adds water to the rivers. We consider this trail moderate because it does involve crossing over water. However, since we’re talking about the start of the river, it’s more like a creek. Take note that rocks can be slippery along the trail. Parris Creek Forest Service road/trail off our road – Mountain laurel blooms mid-spring along the Forest Service road that is located about a quarter-mile up the road from the Inn. And not only is springtime beautiful along this “trail”, the gorgeous Black Mountains (really, we should say green mountains) above Montreat and north of the Inn are easily visible once you round the bend about a mile in, as foliage has come out on the trees, but isn’t yet lush enough to block the views. Tom’s Creek Falls north of Marion – Situated in McDowell County, Tom’s Creek Falls Trail is an easy two-mile loop and includes a picturesque, tiered waterfall. To get to the trail from the Inn on Mill Creek, head east on Main Street/Hwy 70 through Old Fort and turn left onto Hwy 221. Travel about seven miles north on Hwy 221, then turn left onto Huskins Branch Road, just before the old Woodlawn Motel. After 1.5 miles on Huskins Branch Road, you’ll see the gravel parking area on the right and the trail begins there. Four Seasons Trail at Chimney Rock Park – Chimney Rock State Park, located 30 minutes south of the Inn on Mill Creek, has several trails and because it is at a lower elevation, it often gets a head start on spring blooms. 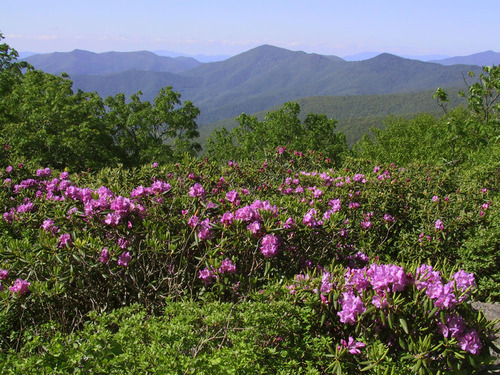 The Four Seasons Trail is appropriately named, but springtime is especially pretty, with wildflowers and mountain laurel. This trail is moderate to strenuous, but not long (a little over a half mile). Please note, there is an admission fee to enter the Park. Botanical Gardens of Asheville walking trail – The Botanical Gardens of Asheville is an independent nonprofit with more than 600 species of trees, plants and flowers that are native to the Southern Appalachians situated on ten acres. April and May are the peak times to see spring blooms, such as trilliums, crested dwarf iris and foamflower, at the Botanical Gardens. An easy, half-mile loop meanders through the gardens and has side-trails for further exploring the grounds. Admission is free; they do welcome donations. 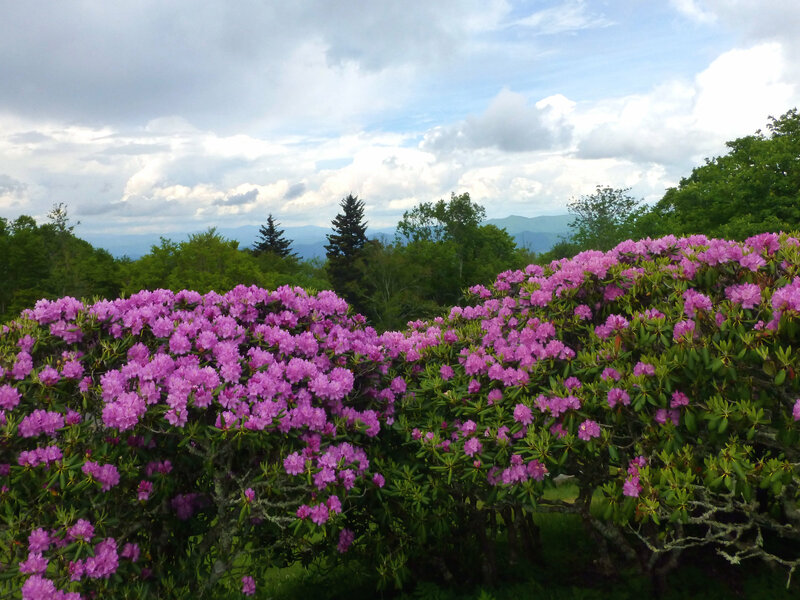 Craggy Pinnacle Trail off the Blue Ridge Parkway – coming to the mountains to see glorious Catawba Rhododendron? Craggy Gardens, north of Asheville on the Blue Ridge Parkway, is known as one of the best places to take in this perfect pink flower in May, and the Craggy Pinnacle Trail (moderate, 1.5 miles roundtrip) will get you to breathtaking views of the surrounding Black Mountain Range awash in springtime green. It’s so beautiful here, we include this hike on our other lists for other seasons. 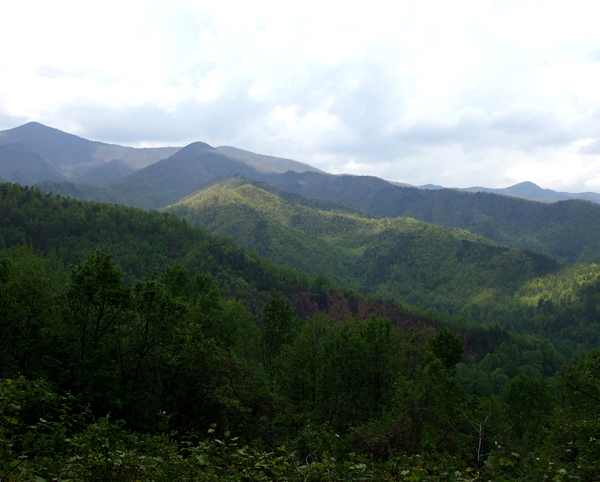 For our guests, we have maps for Craggy Gardens, which have all the hiking trails, including Craggy Pinnacle. Tip: Bring your lunch and take in a picnic at the Craggy Gardens Picnic Area while you’re enjoying this section of the Blue Ridge Parkway. The Woods Walk at Grandfather Mountain – Grandfather Mountain is about 45 minutes from the Inn on Mill Creek. Well-known for its Mile High Swing Bridge and wildlife habitats, it also has several trails and nature walks, including the Woods Walk. This easy, approximately 0.4-mile loop is part of the picnic area on the lower section of the mountain. More than 60 species of flowers and plants and 19 species of trees are located along the trail, and it’s not uncommon to see deer and other wildlife. A more challenging springtime hike at Grandfather Mountain is the Profile Trail on the west side of the mountain. The section of the Blue Ridge Parkway around Grandfather Mountain is also spectacular in springtime, loaded with wildflowers. 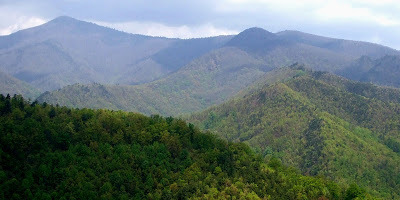 Looking Glass Rock north of Brevard – The Looking Glass Rock Trail, a moderate to strenuous (6.5 miles roundtrip) trail, offers expansive views of the mountains in all their verdant spring glory from atop the impressive Looking Glass Rock. And you’ll pass through tunnels of spring-flowering rhododendron and mountain laurel on the way to the top. Note that Looking Glass Rock is about an hour’s drive from the Inn, off Hwy 276, southwest of Asheville. See a great description of the trail and driving directions at RomanticAsheville.com. Want to see more waterfalls? From the Triple Falls Picnic Shelter, you can hike two miles to the next waterfall, High Falls, which cascades 150 feet down exposed rock. 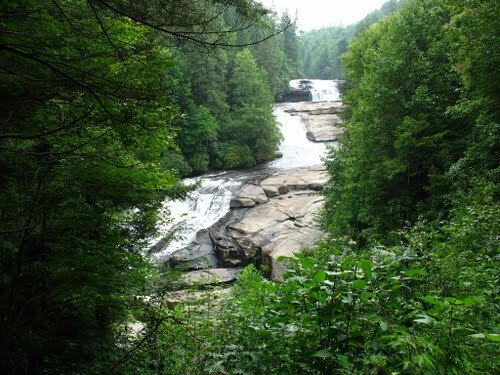 To explore more of Dupont State Forest and its waterfalls, we recommend visiting HikeWNC.info’s Dupont Forest waterfall hike page. Rattlesnake Lodge/Mountains-to-Sea Trail off the Blue Ridge Parkway – The Mountains-to-Sea Trail is currently being planned and blazed, and will eventually run 1,000 miles from Clingman’s Dome in the Great Smoky Mountains to the North Carolina coast (it’s about halfway finished, according to the MST website). Since 1,000 miles seems like a lot of miles to hike, we recommend a 1.5-mile portion of Section 8 of the MST, known as the Rattlesnake Lodge Trail. The trail, abundant with wildflowers in the spring, will bring you to the remains of Rattlesnake Lodge, which burnt down in 1926. To get to the trailhead, take the Blue Ridge Parkway north at the Folk Art Center in Asheville for about 9 miles, then turn onto Ox Creek Road. Follow the road to the right about a half mile and park at Bull Gap. This entry was posted in Uncategorized and tagged Asheville, Blue Ridge Parkway, hiking, Old Fort / Andrews Geyser, outdoors, Spring by Inn on Mill Creek. Bookmark the permalink.